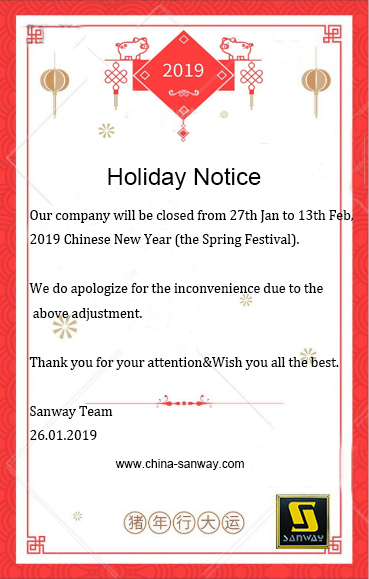 Chinese New Year Holiday Notice - Sanway Professional Audio Equipment Co., Ltd.
Our company will be closed from 27th Jan to 13th Feb, 2019 Chinese New Year (the Spring Festival). During the holiday, we also will reply your email and inquiry, but may not as fast as usual. If you have something urgent, please call our sales team. After the holiday, we will launch some new speakers and new power amplifier with bigger power rate. We do apologize for the inconvenience due to the above adjustment.